These Juicy Jays Pre-Rolled Cones are the newest thing to hit the market. This wrap is flavored a delicious watermelon flavor that is sure to please any smoker. These Juicy Jays Pre-Rolled Cones are the newest thing to hit the market. This wrap is flavored a delicious watermelon flavor that is sure to please any smoker. The wooden tips are soaked using a Triple-dip flavor system, allowing for super long-lasting flavor that you will love. Are you looking for a cone with incredibly sweet flavor? 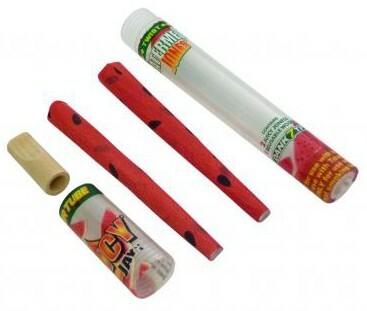 Try these Juicy Jays watermelon flavored cones, you will absolutely love them.